Traffic, Pollution, Accidents: Are Trucks to Blame? 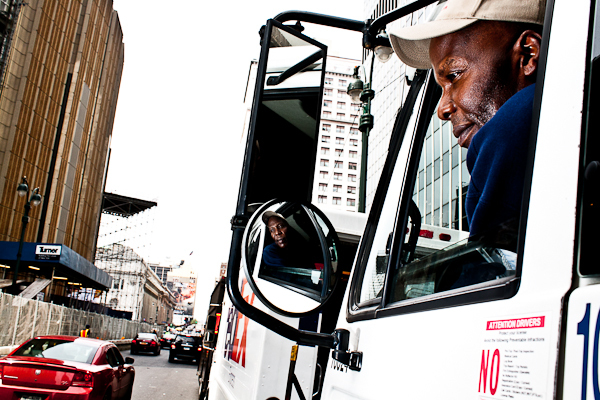 Pierre Joseph, a driver for a food wholesaler, pilots one of the vehicles that carries 82,000 tons of truck traffic into Manhattan on an average day. The first sign of trouble on Pierre Joseph and Curtis Tuckett’s twice-weekly drive into Manhattan came a little before 9 a.m., on Brooklyn’s Fulton Street. In the eastbound lane, just east of Grand Avenue, a Boar’s Head delivery truck was double-parked in front of a deli, forcing the city buses behind it to cross into the opposite lane to pass. The buses, in turn, blocked traffic heading west – including the 24-foot-long refrigerated delivery truck that Joseph was driving toward a day of deliveries, as Tuckett poked at a Daily News crossword puzzle in the passenger seat. The green light turned red, then green again, but traffic did not move. It turned red again, a bus inched around the Boar’s Head truck, and the traffic the bus was blocking crept forward in the opposite direction. Finally the light turned green yet again, and Joseph eased his truck past the bottleneck. He coasted for a dozen or so blocks toward his first destination, a Golden Krust Caribbean Bakery by Flatbush Avenue that was due for a shipment of chicken. New York is hardly a smoothly functioning city from any angle, but seen from the elevated cockpit of a delivery truck, with views that reach for blocks in all directions, down through fellow drivers’ windshields and across sidewalks full of unpredictable pedestrians, it is at its most chaotic. Obstacles emerge and recede; paths close down and open again. Human behavior – the decision to step or not step into traffic, to press the gas pedal or the brake – is jarringly erratic. And as planners search for ways to untangle a knot of urban transportation problems, trucks emerge at every turn, an irreducible reality. A 2010 study by professors at the Rensselaer Polytechnic Institute counted more than 5 million of them within 100 miles of the city, making almost 257,000 deliveries every day in the five boroughs, with more than 40 percent of those stops in Manhattan alone. The question, for planners, academics and policymakers, is how to deal with the costs of all that freight movement. There is air pollution, to which local car and truck traffic is a major contributor in the city, and congestion – according to the Texas Transportation Institute, the city’s delay per peak automobile commuter was 54 hours over the course of 2010, the last year for which numbers have been released. The total cost of congestion to the city’s economy, the institute found, was $9.8 billion – with $2.2 billion of that resulting from truck congestion. The problem is that as loud, dirty, dangerous and unwieldy as trucks may be, they are an essential component of life in the city as it works today. The question, then, is how to mitigate trucks’ impact on the people around them. Some government solutions – like Mayor Bloomberg’s 2008 congestion pricing plan, which would have imposed fees of $8 per car and $21 per truck entering Manhattan’s business district – stalled amid political opposition. Other, more modest plans are in the works – though their chances of success are uncertain. What is certain, from where Joseph and Tuckett sit, is that for all its glamour and surface modernity, New York still runs on a diesel engine. After a long circumnavigation of the block next to the Flatbush Avenue Golden Krust, the truck made its way to another branch of the chain, about a dozen blocks away on Lawrence Street in Downtown Brooklyn. Joseph and Tuckett work for Chef’s Choice, a food wholesaler on Utica Avenue in East Flatbush., and many of their deliveries are the raw ingredients of Caribbean cooking. Joseph, who co-workers call Joe Pierre, has been driving for the company for 22 years. Tuckett has been riding in the trucks for about 15. At the second Golden Krust, Tuckett brought the shipment of dry goods and vegetables inside while Joseph shut the truck off, stood near it on the curb and watched the one-way traffic, slowed by construction near Borough Hall, edge past. The weather was cold, so the truck’s roof-mounted refrigerator unit was turned off. By late March, he said, it would have to be running throughout the day. Any effort to improve truck traffic in the city eventually has to come to terms with a central paradox: Trucks are at the heart of a lot of urban problems, but a lot of truck problems are not caused solely, or even mainly, by trucks. It was about 9:30 a.m. and cars were pulling in and out of the drop-off zone for Helen Keller Services for the Blind, around the corner from the Golden Krust on Willoughby Street, where the truck was parked. An ambulette stopped in traffic, without pulling over, to let its passengers out. When Tuckett came back after 20 minutes, Joseph eased the truck back into the street, behind a blue Toyota Camry. Traffic ahead started moving, but the Camry did not – its driver was studying his phone. The light turned red. As a percentage of vehicles on the road at a given time, trucks are steadily in the single digits, far behind passenger cars. Despite their bad reputation, says Rich Barone, director of transportation programs at the Regional Plan Association, trucks are rarely the cause of congestion. Which is not to say that truck congestion, wherever it comes from, isn’t a problem. Since trucks contribute disproportionately to air contamination and wear on local roads, they are more destructive than cars, unit for unit, when they do get boxed in or forced to go out of their way. It is, then, in every driver’s interest – not to mention retailers and shippers, who pay for their delays – to get them to their destinations as quickly and directly as possible. Especially since, unlike cars (a luxury in a city with abundant mass transit) trucks are a necessary and inevitable part of the current freight delivery system. “The trucks are going to keep coming,” says Barone. The planners’ job is to keep them and all the other vehicles out of each other’s way. Much of the city’s truck traffic starts and ends at its ports – a vast chain of facilities spread across waterfront areas of the two states that border New York Harbor. The heavy-duty trucks that move shipping containers in and out of these terminals, often to locations where their cargo can be broken up and distributed farther, are called drayage trucks, and in recent years the Port Authority has been working to make them cleaner. One program, launched in 2010, offered owners of port drayage trucks made before 2004 money toward the purchase of new ones. Starting in 2011, a new rule banned trucks made before 1993 from entering port facilities. And by 2017, only drayage trucks with engines meeting model year 2007 emissions standards – which drastically limit the emission of pollutants like particulate matter, nitrogen oxides and non-methane hydrocarbons – will be allowed. Beyond the kind of engine drayage trucks use is another issue: the sheer number of trips (10,000 a day) that trucks make in and out of the Port Authority of New York and New Jersey’s marine container terminals. More than three-quarters of them start or end at the 2,230-acre Port Newark-Elizabeth Marine Terminal, and reducing them seems unlikely. They could, however, be further consolidated. In particular, the future of the Red Hook, Brooklyn container terminal, New York City’s only port east of the Hudson River, is in question. Last fall the Port Authority bought out the lease of American Stevedoring, the company that had been operating the terminal, and gave a short-term lease to Phoenix Beverages, a beer distributor that receives cargo through the facility. The authority has not said, though, what will happen when the Phoenix lease expires late this year. Ward, who now works as an executive at the international construction company Dragados, had called as head of the Port Authority for Red Hook’s container operations to move farther down the Brooklyn shoreline to Sunset Park, arguing in part that that rail access is better in the latter neighborhood, and that it is closer to the hypothetical future site of Rep. Jerrold Nadler’s proposed Cross-Harbor Rail Freight Tunnel. One problem for shipping in Red Hook is a reality that is clearly visible from the cab of Joseph and Tuckett’s truck: Freight traffic is not really compatible with the kind of healthy urban street life that makes a neighborhood attractive to residents and pedestrians. In Red Hook, what many residents might consider quality-of-life improvements—things like the new Brooklyn Bridge Park, the multiplying number of restaurants on Columbia Street and thousands of new people moving to the area—freight planners call encroachment on the port.. As Red Hook’s population has grown, it has become a more difficult place to move trucks through quickly. The impact on local truck traffic, should Brooklyn’s container facilities go away permanently, is hard to analyze. In that case, all goods coming into the port and headed east of the Hudson would have to be trucked across bridges from New Jersey. But the situation now is just as complex: Without a rail link between the Red Hook port and the rest of the country, for example, cargo arriving in Brooklyn that is to be shipped out by train, must travel, by truck, over the same bridges in the other direction. Late last year, federal Customs officials announced that the Red Hook facility – which they noted handles just one percent of the overall port’s container traffic – would be losing its inspection station. The result is that goods coming into Red Hook would have to be brought to Staten Island or New Jersey before heading to their final destinations. They would make that journey, of course, by truck. 200 Hours a Year on the Subway: What To Do? Every year, the average commuter spends what adds up to several days underground. Most riders have set habits for how they use that time. A Muslim New Yorker says the ads by an anti-Islam group are absolutely legal–and absolutely immoral. Some say there are too few bike lanes in low-income areas. But bike paths that do exist in those neighborhoods can stir resentment. How divided are Brooklynites when they get on two wheels?